UPDATE: Bellator 215 is over. The main event ended in the first round when Matt Mitrione landed an accidental low blow on Sergei Kharitonov. The kick landed hard enough to where Kharitonov couldn’t continue. Bellator 215 (see weigh-in results here) is set to begin. The card will take place tonight (Feb. 15) inside the Mohegan Sun Arena in Uncasville, Connecticut. The main card is set to feature five bouts. This will be the first event of a doubleheader. Bellator 216 takes place tomorrow night. 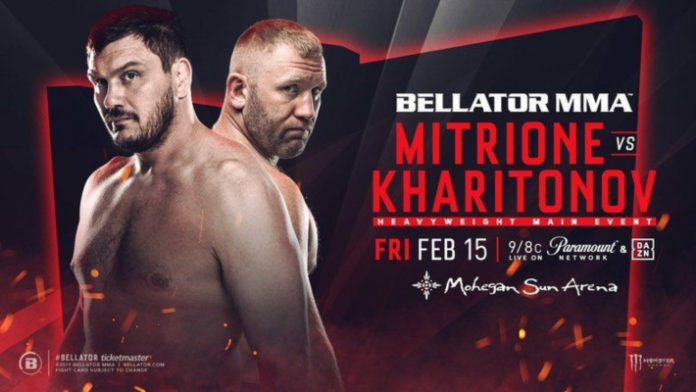 In the main event of Bellator 215, Matt Mitrione will meet Sergei Kharitonov. The co-main event will see undefeated welterweight Logan Storley go one-on-one with Ion Pascu. We’ve also got Austin Vanderford set to make his Bellator debut against Cody Jones. The main card airs on the Paramount Network and DAZN at 9 p.m. ET.